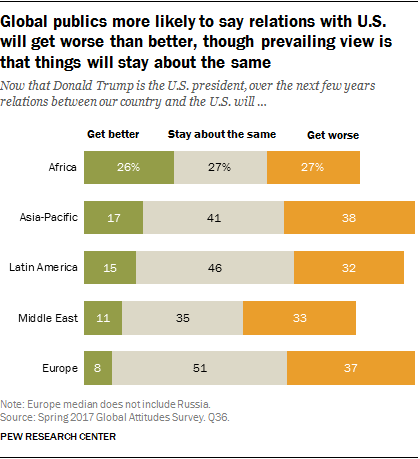 The sharp decline in how much global publics trust the U.S. president on the world stage is especially pronounced among some of America’s closest allies in Europe and Asia, as well as neighboring Mexico and Canada. Across the 37 nations polled, Trump gets higher marks than Obama in only two countries: Russia and Israel. 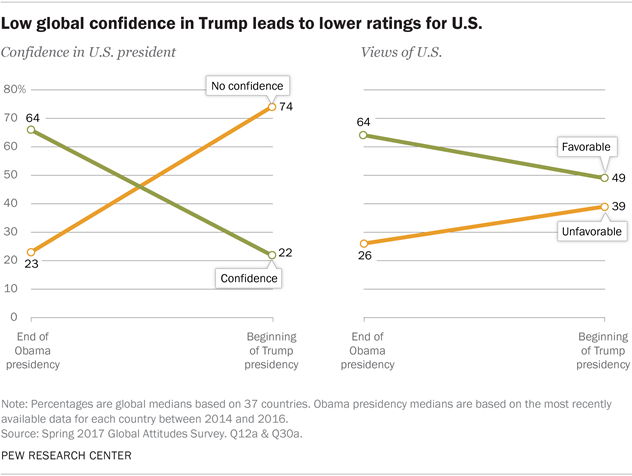 In countries where confidence in the U.S. president fell most, America’s overall image has also tended to suffer more. In the closing years of the Obama presidency, a median of 64% had a positive view of the U.S. Today, just 49% are favorably inclined toward America. Again, some of the steepest declines in U.S. image are found among long-standing allies. Since 2002, when Pew Research Center first asked about America’s image abroad, favorable opinion of the U.S. has frequently tracked with confidence in the country’s president. Prior to this spring, one of the biggest shifts in attitudes toward the U.S. occurred with the change from George W. Bush’s administration to Obama’s. At that time, positive views of the U.S. climbed in Europe and other regions, as did trust in how the new president would handle world affairs. While the new U.S. president is viewed with doubt and apprehension in many countries, America’s overall image benefits from a substantial reservoir of goodwill. The American people, for instance, continue to be well-regarded – across the 37 nations polled, a median of 58% say they have a favorable opinion of Americans. U.S. popular culture, likewise, has maintained appeal abroad, and many people overseas still believe Washington respects the personal freedoms of its people. These are among the major findings from a new Pew Research Center survey conducted among 40,448 respondents in 37 countries outside the U.S. from Feb. 16 to May 8, 2017. The drop in favorability ratings for the United States is widespread. The share of the public with a positive view of the U.S. has plummeted in a diverse set of countries from Latin America, North America, Europe, Asia and Africa. Favorability ratings have only increased in Russia and Vietnam. As Pew Research Center’s global surveys from George W. Bush’s presidency illustrated, many of Bush’s key foreign policies were unpopular, and by the time he left office Bush was viewed negatively in most of the countries we polled. His successor, Obama, generally received more positive ratings throughout his White House tenure. Today, in many countries, ratings for President Trump look very similar to those for Bush at the end of his term. This pattern is especially clear in Western Europe. 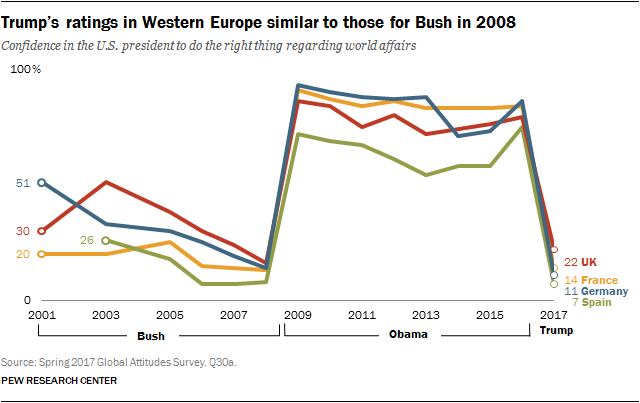 In the UK, France, Germany and Spain, the low levels of confidence in Trump are very similar to the poor ratings for Bush in 2008. In addition to exploring global views of President Trump, this survey also examines attitudes toward three other major leaders on the international stage. 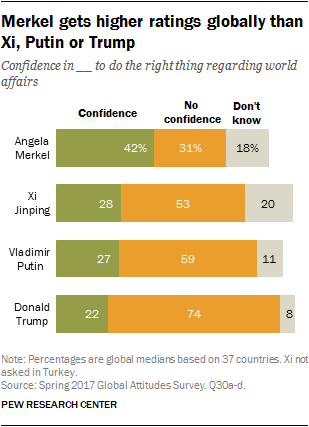 The results demonstrate that Trump is not the only world leader in whom global publics lack confidence. Chinese President Xi Jinping and Russian President Vladimir Putin also get poor marks, though neither is rated as negatively as the U.S. president. Across the 37 nations surveyed, a median of 28% voice confidence in Xi, while 27% feel this way about Putin. In contrast, 42% express confidence in the long-serving German Chancellor Angela Merkel, while just 31% lack confidence in her. A median of 60% in Europe have confidence in Merkel, and her ratings are particularly strong on the political left, even though she hails from the right-of-center Christian Democratic Union (CDU). Xi and Merkel are somewhat less well-known than Trump and Putin. Roughly one-in-five globally do not offer an opinion about the Chinese and German leaders. On questions throughout this report, median percentages are reported to help readers see overall patterns. The median is the middle number in a list of figures sorted in ascending or descending order. In a survey of 37 countries, the median result is the 19th on a list of country-level findings ranked in order. In addition to medians of respondents across the survey’s 37 countries, this report sometimes refers to the median among a specific subset of respondents and/or countries by region. For example, we can look at European medians across 10 countries, where the median is the average of the fifth and sixth figures when the countries are listed from highest to lowest. We can also calculate the medians across seven Asian-Pacific nations, five Middle East-North African nations, six sub-Saharan African nations and seven Latin American nations. The 2017 survey examines attitudes toward five major policy proposals that President Trump has supported. Globally, none of them are popular. As a candidate, Trump repeatedly pledged to withdraw the U.S. from the nuclear weapons agreement with Iran, though he has yet to do so as president. On balance, global publics oppose this idea. Only in Israel and Jordan do majorities support U.S. withdrawal from the agreement. About a third globally express support for Trump’s proposed ban on people entering the U.S. from certain Muslim-majority nations, although there are four countries – Hungary, Israel, Poland and Russia – where more than half endorse this proposal. Opposition is especially strong in several countries with Muslim-majority populations, including Jordan, Lebanon and Senegal. The survey, which was conducted before Trump officially announced that the U.S. would pull out of the Paris climate change accord, finds widespread opposition to the U.S. withdrawing from international climate change agreements. A median of only 19% support the U.S. backing away from accords like the one signed in Paris – similar to the low level of support for the U.S. rejecting major trade agreements. (Trump pulled the U.S. out of the Trans-Pacific Partnership trade deal early in his administration.) 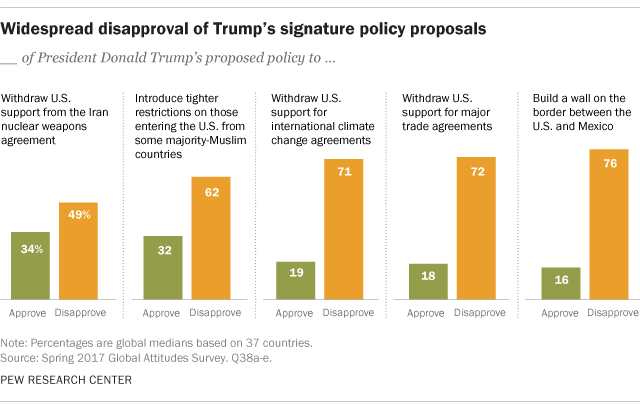 Opposition to the U.S. withdrawing from climate and trade agreements is especially strong in the European nations polled. A median of just 16% endorse Trump’s plan to build a wall between the U.S. and Mexico. Fully 94% of Mexicans oppose the wall, and the wall is strongly rejected throughout Latin America, as well as in much of Europe. There is no country among the 37 surveyed in which a majority endorses a border wall between the U.S. and Mexico. Survey respondents were read a list of positive and negative characteristics, and for each one, were asked whether it describes Donald Trump. 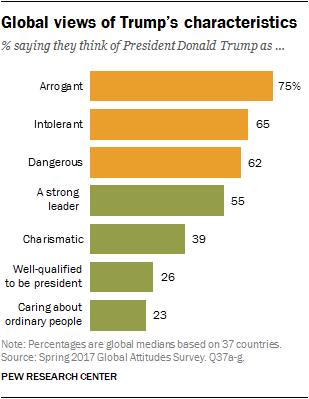 Around the globe, people associate a number of negative characteristics with the U.S. leader. Most say he is arrogant, intolerant and dangerous, while few think of him as well-qualified or as someone who cares about ordinary people. Describing Trump as charismatic is more common, although global publics on balance do not think of him as charismatic either. They do, however, see Trump as a strong leader – a median of 55% across the nations polled describe him this way. Attitudes toward the U.S. president and American foreign policy have a major impact on how people around the world view the United States, but other factors are important too. The nation’s culture, ideas and people – elements of what is sometimes referred to as “soft power” – also shape how people around the world see the country. In this poll, as in previous Pew Research Center surveys, some aspects of American soft power have stronger global appeal than others. The American people are core to how the U.S. is perceived around the globe. Overall, Americans are seen more positively than the U.S. as a country. Across the nations polled, a median of 58% say they have a favorable impression of Americans. Positive views are especially common in Asia and Europe. They are less common, however, in the Middle East – Turkey, Jordan and Lebanon are the only nations polled where majorities express an unfavorable opinion of Americans. Along with its citizens, America’s popular culture is often well-regarded abroad. Roughly two-thirds across the countries surveyed like American music, movies and television. Europeans and Asians are particularly likely to find U.S. pop culture appealing, while these types of cultural exports are less popular in several Muslim-majority nations. Despite the doubts sown several years ago by revelations of American spying on foreign leaders and citizens, across the 37 countries polled this spring a median of 54% believe the U.S. government respects the personal freedom of its people. In Europe, America’s reputation for individual liberty was damaged by the U.S. National Security Agency’s spying revelations and has not recovered – today, a median of 52% across the 10 European nations polled say Washington respects personal freedoms, while nearly as many (a median of 44%) say it does not. The U.S. gets higher marks on this issue in Asia and Africa. But America’s influence around the world is not always welcome. For example, even though many people say they personally like American popular culture, a global median of 54% worry that the influx of U.S. customs and ideas into their country is a bad thing. A U.S. export that not all publics embrace is American-style democracy. While publics around the world generally endorse broad democratic principles, they offer mixed views regarding American ideas about democracy: Globally, a median of 43% say they like these ideas, while 46% say they dislike them. 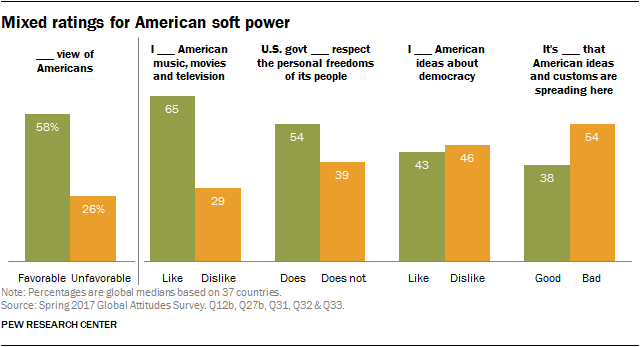 As with several other aspects of U.S. soft power, U.S.-style democracy is particularly popular in the African and Asian nations surveyed. Respondents were asked whether, now that Trump is president, they think relations between their country and the U.S. will improve over the next few years, get worse, or stay about the same. In many countries, a majority or plurality believes relations will remain about the same. However, in most regions of the world, the share of the public that believes things will worsen outweighs the share that thinks relations will improve by a ratio of two-to-one. While relatively few say they expect relations to improve, more than half hold this view in Russia and Israel. Looking at findings on U.S. favorability and confidence in the American president in Russia, Israel, Germany, Mexico and Canada illustrates different patterns Pew Research Center surveys have discovered over time regarding attitudes toward the U.S. and its leader. Amid ongoing controversies and investigations into allegations of links between the Trump presidential campaign and Russia, attitudes toward the U.S. have turned more positive in Russia. Following the outbreak of the Ukraine crisis in 2014, ratings for both the U.S. as a country and for President Obama plummeted. 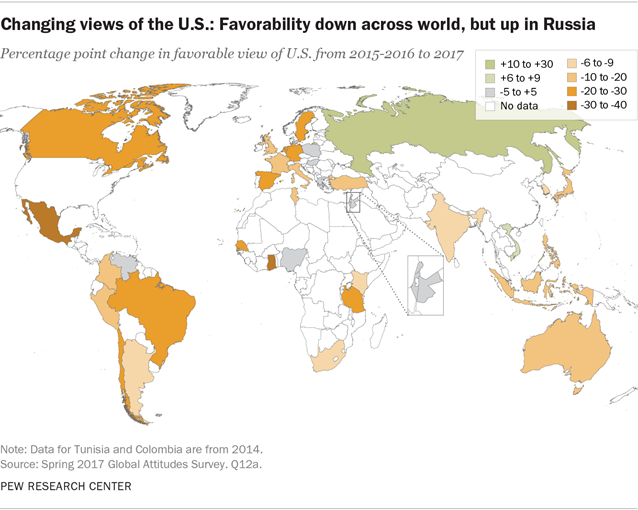 However, since 2015 – the last time the Center polled in Russia – favorable opinions of the U.S. have become much more common there. And President Trump gets more-positive reviews in Russia than either of his predecessors ever did. In survey after survey, Israelis give the U.S. some of its highest favorability ratings, and that’s true again this year, with 81% saying they have a positive view of the U.S. Assessments of American presidents, however, have fluctuated. In 2003, President George W. Bush received very high ratings, but those declined a bit over the course of his presidency. Obama’s confidence ratings varied from 49% to 71% in the Center’s polling in Israel during his administration. Between 2014 and 2015, his ratings dipped substantially, reflecting tensions between Obama and Prime Minister Benjamin Netanyahu over the Iran nuclear deal. 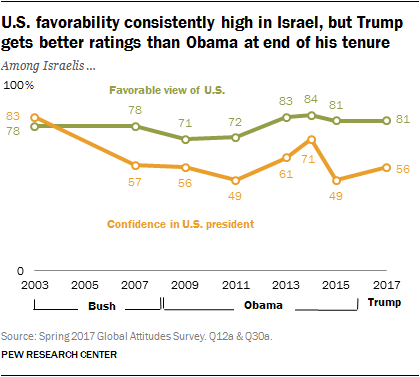 Israel is one of only two countries (Russia being the other) in which Trump’s ratings are higher than Obama’s during the final two years of his administration. In Germany – and in several of its Western European neighbors – attitudes toward the U.S. have followed a clear pattern over the past decade and a half. President George W. Bush was not very popular at the outset of his presidency, and he grew less so over the next few years, amid widespread German opposition to key elements of his foreign policy. This in turn had a negative impact on America’s overall image in the country. President Obama, in contrast, was extremely well-regarded (although his ratings did decline somewhat following the NSA eavesdropping scandal), and this coincided with an improvement in attitudes toward the U.S. Today, German confidence in Trump is low, and U.S. favorability is near where it was at the end of the Bush years. America’s image has turned negative in the two nations with which it shares a border. Over the past decade, U.S. presidents have gotten mixed or negative reviews in Mexico, but at 5% Donald Trump registers the lowest confidence rating of any U.S. leader in Mexico since Pew Research Center began surveying there. This 5% rating is also the lowest among the 37 nations polled in 2017. The proposed wall between the U.S. and Mexico has been a high-profile position for Trump since he declared his candidacy for president, and more than nine-in-ten Mexicans oppose it. 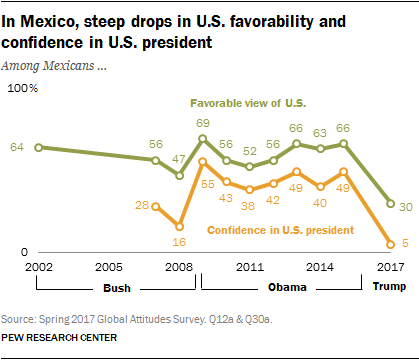 U.S. favorability has typically been higher than confidence in the American president in Mexico. That remains the case this year, although the share of the public with a positive view of the U.S. has dropped steeply since 2015. 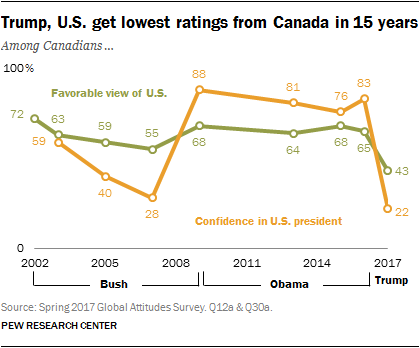 Trump receives dramatically lower ratings than his predecessor in Canada. And for the first time since the Center began polling in Canada, the share of Canadians expressing a favorable opinion of their neighbor to the south has slipped to below 50%. Just 43% of Canadians now have a positive view of the U.S.